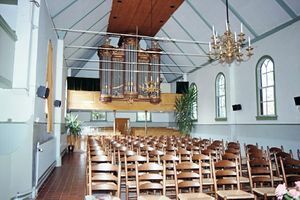 Interior of the Doopsgezinde Kerk, Den Burg. Den Burg, pop. (1950 5,000; 2001 6,000), principal town on the Dutch island of Texel, where soon after 1530 Anabaptism gained a foothold. On 15 September 1534 an Anabaptist of Texel, Thijs Olbrants, received the death sentence; 15 September 1534, 12 Anabaptists were banned for life; on 16 December, 1564, Jan Gerrits of Texel was burned at the stake in The Hague. During these years a congregation existed of which Simon Fijts was the minister in 1569. Between 1563 and 1582 Leenaert Bouwens visited the island twice and baptized 13 persons there. Shortly after this we also find division here among the Mennonites. In Den Burg there were two congregations, one Frisian and the other Flemish. The former had its church on the site where the present church now stands; the Flemish church still existed in 1950 as a warehouse at Achter de Wal. About 1660 the parties were no longer strictly separated from each other. Shortly after this date the Flemish formed one congregation with members of the nearby villages of Oosterend, de Waal, and Den Hoorn, in which union the Waterlander congregations from Oosterend and de Waal were also included. From this federation Den Hoorn separated in 1707. In 1772 (19 July) the Frisians joined the United Flemish and Waterlanders and the church building was enlarged in 1774. It was intended that henceforth there should be one congregation on the island with a single church board and administration of all property. The congregation of Den Hoorn, however, did not go along with this union. There is a letter (Inv. Arch. Amst. II, No. 1636) written about 1775 by members of Den Burg, "who on account of the orthodoxy and the intolerance of Ds. Jan Stuurman have separated themselves and established their own church," to the church board of the Lamist congregation at Amsterdam, requesting subsidy for the support of their minister Gerbrands, which they received. Concerning this separated congregation nothing more is known. It presumably maintained its position for only a short time. Concerning the further history there is not much to relate. About 1780 the congregation held steadfastly to the principle of nonresistance and in 1807 still obtained freedom of military service from Louis Napoleon, who was then king of Holland. In 1857 the size of the congregation made an enlargement of the church necessary, and in 1869 an organ was acquired. The membership totaled approximately 200 in the Flemish congregation in 1731. At the time of the union in 1772 there were 359 members; in 1814, 307; in 1861, 498; in 1898, 680 in addition to 40 in Den Hoorn; in 1950, 650. 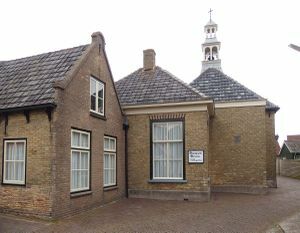 The congregation at Den Hoorn joined with this church in 1949, so that in 1950 there was only one congregation at Den Burg, Waal, Oosterend, and Den Hoorn, now called the Mennonite congregation of Texel. The ministers during the 19th-mid 20th century were: J. Huizinga, 1844-1879; A. W. Huidekoper, 1861-1863; J. Boetje, 1864-1868; C. J. Bakker, 1868-1871; H. Koekebakker, 1871-1875; P. S. Bakels, 1876-1879; S. F. van der Ploeg, 1880-1884; R. Kuperus, 1889-1919; C. C. de Maar, 1919-1925; Dr. A. Vis, 1925-1939; K. T. Gorter, 1939-1941; J. Knot, 1941-1946; Th. van der Veer, 1942-1946; Th. van Veen 1947-1953. The congregation in 1953 had an active family help organization; there were also youth organizations and work was done in behalf of young people. An old people’s home was in the process of being started in cooperation with the other Protestant denominations. Cate, Steven Blaupot ten. Geschiedenis der Doopsgezinden in Holland, Zeeland, Utrecht en Gelderland, 2 vols. Amsterdam: P.N. van Kampen, 1847: v. I-II, passim. Doopsgezinde Bijdragen (1861): 168 f.; (1873): 140-174. Hege, Christian and Christian Neff. Mennonitisches Lexikon, 4 vols. Frankfurt & Weierhof: Hege; Karlsruhe: Schneider, 1913-1967: v. I, 301. Hoop Scheffer, Jacob Gijsbert de. Inventaris der Archiefstukken berustende bij de Vereenigde Doopsgezinde Gemeente to Amsterdam, 2 vols. Amsterdam: Uitgegeven en ten geschenke aangeboden door den Kerkeraad dier Gemeente, 1883-1884: v. II, Nos. 1611-1638. Zijpp, Nanne van der. "Den Burg (Texel, Noord-Holland, Netherlands)." Global Anabaptist Mennonite Encyclopedia Online. 1953. Web. 22 Apr 2019. http://gameo.org/index.php?title=Den_Burg_(Texel,_Noord-Holland,_Netherlands)&oldid=143938. Zijpp, Nanne van der. (1953). Den Burg (Texel, Noord-Holland, Netherlands). Global Anabaptist Mennonite Encyclopedia Online. Retrieved 22 April 2019, from http://gameo.org/index.php?title=Den_Burg_(Texel,_Noord-Holland,_Netherlands)&oldid=143938. Adapted by permission of Herald Press, Harrisonburg, Virginia, from Mennonite Encyclopedia, Vol. 1, p. 472. All rights reserved.